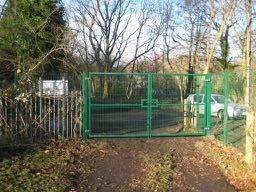 We have new secure main gates to match the fence, thanks to Leeds Wellbeing Fund from the Inner North West Community Committee. After our new fence was installed along the bottom of our site there was still one big gap in our security: the old main gates. These were very solidly built, but only about five feet high and easy to climb or to pass stolen items over. Also, they were too narrow to allow large delivery lorries to come through. For these reasons we wanted to replace them with new gates which were taller, wider, strong, and like the new fence. Expensive! We applied for grants, and Leeds City Council’s Wellbeing Fund from the Inner North West Community Committee awarded us a generous £1370. This was enough for a beautiful new gate from Airedale Fencing, the same firm that did our new fence.